Feeling anxious during dangerous situations has been crucial to the survival of the human species, but for many people, this is more of a hindrance than a benefit. Chronic feelings of panic can even manifest themselves into anxiety. Anxiety affects around 40 million American adults every year, and the causes often due to a myriad of psychological, genetic, and environmental factors. 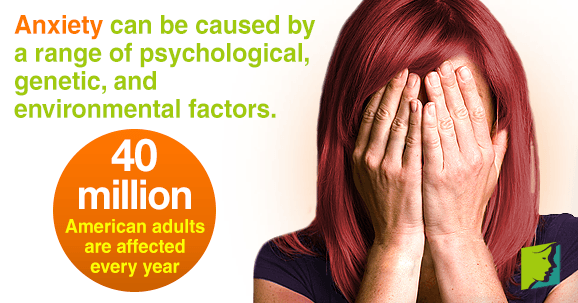 Keep reading for more information on this psychological disorder. Anxiety as a psychological condition is not confined to just one type - there are many ways the anxiety can manifest itself. Read on for a list of recognized types of anxiety. This is when a person has frequent and recurring panic attacks, sometimes for no apparent reason. Officially, 2.7% of the American population suffers from a panic disorder, with women being statistically twice as likely to be diagnosed as men. About 3.3% of the American population are affected by PTSD, and the most likely trigger is sexual assault; approximately 55% of sexual assault victims will develop the disorder at some point of their lives. This disorder can occur directly after a distressing event or even years later, and it often leads to flashbacks of the incident, resulting in outbursts. These typically begin in childhood, but can develop at any time. A phobic disorder is an irrational fear of a particular trigger, which differs from person to person. Common phobias are heights, insects, or flying. A sufferer will often have the irrational sense of having to avoid their particular phobia at all costs, and this can affect daily life and relationships. The sense of anxiety is often overpowering and beyond the individual's control, even though he or she might be aware of the irrationality of the situation. OCD can be a very destructive anxiety disorder, as it involves unwanted and obsessive thoughts. It is characterized by repetitive, ritualized, and uncontrollable behaviors you feel compelled to perform. This is a long-term illness that means the individual is anxious about a wide range of things that would seem illogical or minor to someone without the condition. Feeling constantly on-edge and having a chronic sense of fear are typical of someone suffering from GAD. Anxiety is a complex illness and comes in many different forms, with no two sufferers experiencing it in the same way. It can be a scary and isolating condition to have, and can be caused by other psychological illnesses, such as a depression. Luckily, anxiety is treatable, so it is important to recognize the signs as soon as they arise so that help can be sought.